The kidneys are the body's filtering system. They pull waste and extra water from the blood and take it out of the body as urine. The filtering parts of the kidneys are called nephrons. Nephrons have many small blood vessels in them. High blood sugar levels and uncontrolled high blood pressure can damage these small blood vessels. Damage to the nephrons is called nephropathy. In the early stages of nephropathy, the body doesn't give any warning signs that the damage is happening. The earliest sign of diabetic kidney disease is an increased excretion of albumin in the urine. This is present long before the usual tests done in the doctor's office show evidence of kidney disease, so it is important for diabetics to have this test on a yearly basis. As a diabetic's kidneys fail, their blood urea nitrogen (BUN) levels will rise as well as the level of creatinine in the blood. Diabetics may also experience nausea, vomiting, a loss of appetite, weakness, increasing fatigue, itching, muscle cramps (especially in the legs) and anemia (a low blood count). Diabetics may find you need less insulin. This is because diseased kidneys cause less breakdown of insulin. If a diabetic develops any of these signs, they should call their doctor. Diabetes can lead to changes in the kidneys that happen in stages. 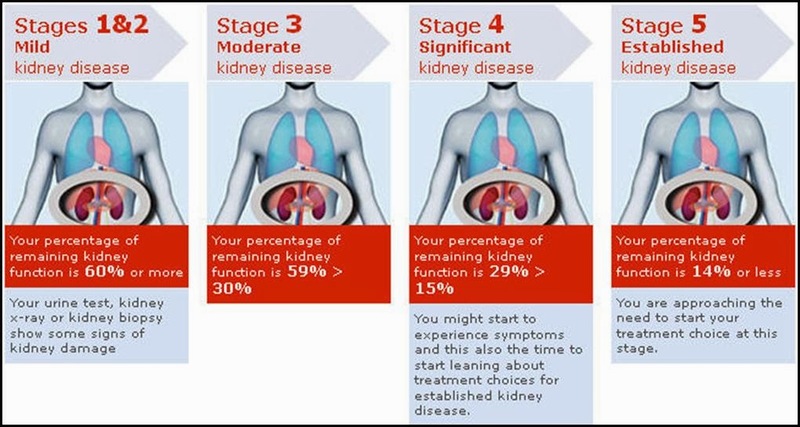 In the early stages, stages 1 through 3, the kidneys are able to make up for the damage and there aren't any obvious signs that the damage is happening. When enough damage occurs, in stages 4 and 5, the kidneys lose their ability to filter and cleanse the blood. Stage 2: The kidneys start showing damage in stage 2, as small amounts of protein (albumin) begin to leak into the urine. The kidneys will normally try to keep from filtering protein into the urine because protein is such an important building block for the body. Albumin in the urine in this small amount (200 micrograms or less per milligram of urine) is found by a test called the microalbumin urine test, done at the lab. Remaining kidney function: 60% or more. At this stage, treatment includes quitting all tobacco products, controlling high blood pressure, keeping blood sugar levels as close to normal as possible, and, if really necessary, using an ACE inhibitor or similar drug. Doing these things can protect the kidneys against any further damage. (But, keep in mind that extended drug use can damage the kidneys over a period of years). Stage 3: The loss of albumin into the urine is more than 200 micrograms per milligram at this stage. This is enough protein to be found by using a urine dipstick test, which can be done at your doctor's office. Treatment will still focus on controlling high blood pressure and keeping blood sugar levels as close to normal as possible. Remaining kidney function: 30% to 59%. Stage 4: By stage 4, also called advanced clinical nephropathy, the kidneys have become badly damaged from poorly controlled diabetes. Large amounts of protein leak out into the urine and signs of kidney damage start to show. These signs can include swelling in the legs and feet, high blood pressure, and high cholesterol and triglyceride levels. Remaining kidney function: 15% to 29%. Treatment will include supporting remaining kidney function, controlling blood pressure, and keeping blood sugar levels as stable as possible. 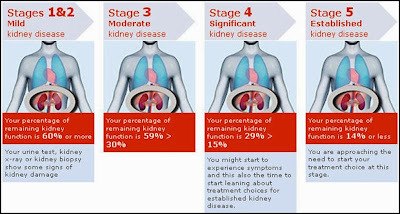 Stage 5: By the time a patient gets to this stage, called end stage renal disease, the kidneys have failed. The patient will need expensive therapy and medicine as well as kidney dialysis. When kidneys fail, waste products have to be regularly removed from the blood by a dialysis machine that does the filtering work of the kidneys. Remaining kidney function: Less than 15%. Some people might benefit from getting a kidney transplant, but most will have to wait years for a donor kidney. After having a kidney transplant, people need to take many different medicines to make sure the body doesn't reject the transplanted kidney. Note: About 30 percent of patients with Type 1 (juvenile onset) diabetes and 10 to 40 percent of those with Type 2 (adult onset) diabetes eventually will suffer from kidney failure.